Over 40 million tonnes of electric and electronic waste (also known as e-waste) are produced worldwide every year. That is boundless heaps of refrigerators, computers, television sets, ovens, telephones, air conditioning units, lamps, toasters and other electric and electronic devices, with a total weight equal to seven times that of the Great Pyramid of Giza. The greatest producers of e-waste per person are the United States and the European Union, while developing countries, such as China, are producing an ever-increasing amount. Only a small part of this waste – about 15.5% in 2014 – is recycled with methods that are efficient and environmentally safe. The West African country of Ghana, currently undergoing intense economic growth, is an important centre for receiving, re-using, recovering and disposing of electronic waste. Accra, the capital, hosts a thriving second-hand market, a sprawling network of repair shops, and a range of activities which attempt to tap into the full potential of e-waste. And yet, it is also the location of an enormous and heavily polluted electronic waste dumpsite. 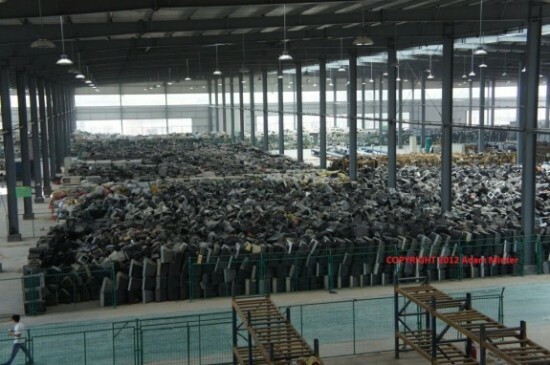 Anatomy of a Myth: the World’s Biggest E-Waste Dump Isn’t. Let’s start with two photographs. The first was shot by me in China’s Hunan Province. It shows a warehouse that contains roughly 5,000 old locally-collected televisions awaiting recycling. This photo only captures a portion of what is a big inventory, and a big operation. Every day more arrive. Most people outside of China have never heard of this place, mostly because it is indoors, and difficult for journos and activists to gain access to. Next, a photo tagged “e-Waste – field of computers” that I came across while looking at a Google map of Agbogbloshie, a suburb of Accra, Ghana that everyone from the Guardian to Motherboard has called the world’s “biggest” or “largest” e-waste dump. There’s nothing good or right in the Agbogbloshie photo. The pollution it depicts is nasty. But if you can get past the shock and evaluate the volume of e-waste in the image, it’s not much – especially compared to what we see in the China photo. 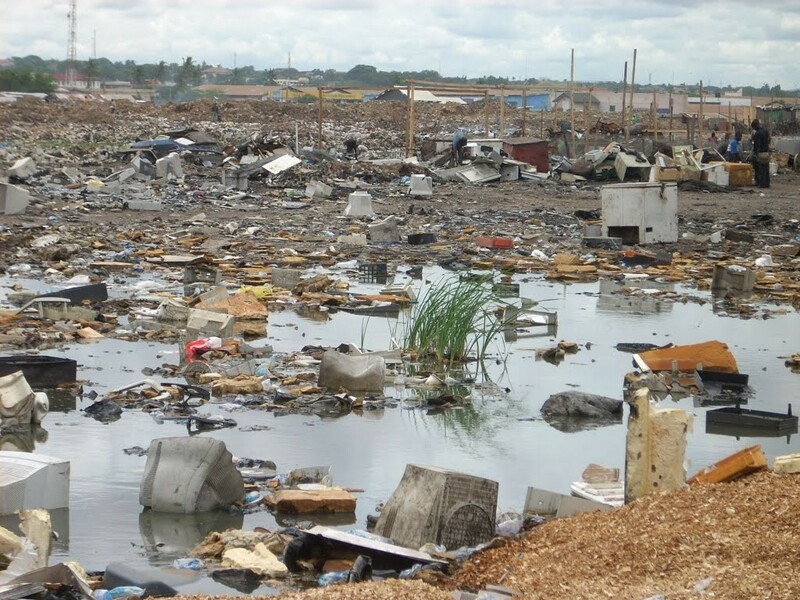 Indeed, despite the parade of Agbogbloshie slideshows posted by media outlets over the years, there’s a curious dearth of images showing large volumes of e-waste at the site. Rather, the genre is almost exclusively devoted to pictures of laborers, oftentimes not even processing waste – see this useless and exploitative New York Times slideshow, or this more recent one from Motherboard. My long-standing suspicion has been that there aren’t any great volumes of e-waste at Agbogbloshie, and that most of the journalists and photographers who go there – having had no experience with developing world recycling – document their shock, but not what’s actually happening, frankly because they don’t know better. This matters. Agbogbloshie has become a global symbol for what’s alleged to be a vast and growing environmental problem: the export of e-waste from the developed world to West Africa. Yet in recent years, academic and UN-sponsored research has shown that the problem is far more complex – and, in all respects, smaller – than what’s being depicted. In other words – we’re not talking about the world’s largest e-waste dump. So what I’m going to do is show how somebody with actual experience reporting in and around the global recycling industry – especially in the developing world – looks at Agbogbloshie. My background is that of a journalist who has been writing about and photographing the industry for 15 years, and has visited hundreds of recycling facilities, especially in the developing world. In March and April, I visited Accra. Dos hombres trabajan en el basurero tecnológico de Agbogbloshie, en las afueras de Accra.M. R.
Se sienta encima de un televisor, o más bien en lo que queda de él. A veces prefiere el monitor de un ordenador de aquellos que antes andaban por casa. Utiliza un destornillador para hacer palanca pero también un martillo para quebrar el plástico y aquellos materiales que ocultan lo que tiene un precio: el cobre, el oro, la plata o el aluminio, entre otros metales. Cuando se trata de cables, ratones, pequeñas piezas o incluso teclados les prende fuego para obtenerlos. Un pequeño alboroto de cables que produce una gran humareda oscura. Se llama Kojo pero también podría ser Joseph, Isaac, Saad… Todos ellos trabajan en Agbogbloshie, el barrio de Accra, la capital de Ghana, donde se encuentra uno de los vertederos tecnológicos más grandes del mundo. “No nos gusta que vengan a vernos”, cuenta uno de dos jefes que dicen controlar todo aquel lugar, “luego en Internet aparecen artículos que llaman a esto con un nombre equivocado [refiriéndose a la palabra vertedero]. Esto es un negocio. Seleccionamos los metales que interesan a otros y se los vendemos“. Así funciona Agbogbloshie. Este lugar es un eslabón más de la cadena en un mundo donde las tecnologías han ocupado ya un lugar central en nuestras vidas. Un mundo donde los países desarrollados demandan cada vez más aparatos que cuando quedan obsoletos tienen que ir a parar a algún sitio. “Existen empresas de reciclado de estos materiales en Europa pero es más caro procesarlos allí. Es más barato enviarlo lejos y por eso los traen a África, sobre todo a Ghana y Nigeria, como si fuera un donativo“, explica Emmanuel K. Dogbevi, periodista ghanés interesado en este tema desde que en 2007 escribiera el primer artículo sobre el asunto. Non-profit organization tricks liberals into donating money to shred working computers, so that big corporations can sell more brand new cell phones and computers? If reports are true, it may be the biggest environmental hoax of our decade. And most ardent objections come from not from the accused industry, but from environmentalists and technicians in developing world markets. Four other studies, from Africa and South America, show similar reuse rates (see linked articles). And they also trace the “e-waste” filmed at primitive dump yards to city collectors, who are actually bringing decades-old equipment for scrapping… not recently imported goods. According to industry professionals, the “primitive e-waste” scam tricks Americans and Europeans into shredding functional and working assets. When processed into pieces of scrap, the computers cannot be reused by the fastest growing internet market in the world. Three billion people – people who are not the poorest, not the richest – earn about $3500 per year. In the past decade, that middle 3 billion has accessed the internet at 10 times the rate of growth of wealthy OECD nations. Those three billion people, living in cities like Accra, Jakarta, Cairo, Lima and Guangzhou, are the same color and speak many of the same languages as the poorest people in the world… the poorest people who need vaccines, education, electricity, clean water, not computers. By equating these two different markets, combining 6 billion people, the non-profit watchdogs blur the line between destitute and converging/emerging markets. Critics say this is a scam to leverage colonialist European guilt and good intentions. The “non-profits” are after your money, they say, and use fraudulent photos to make the case. 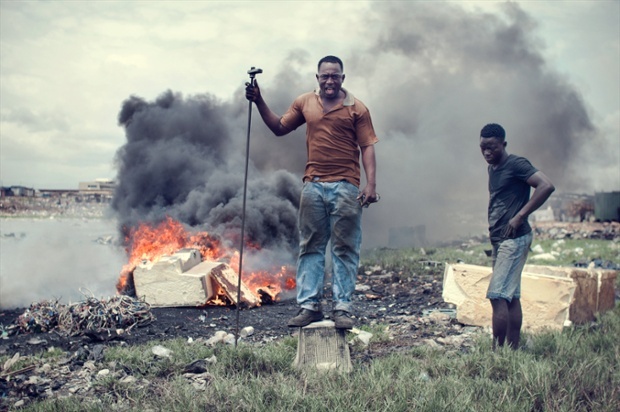 Photos and film of “Ewaste” at African dumps are real, of course. And the standard of living for scrappers living at those dumps is serious. But multiple reports now show that most of the waste being burned and beated at these dumps was used for decades in African cities like Accra, Cairo, and Lagos. Africans trade in used electronics to reuse shops, the way Westerners would turn in a used car. Using the “watchdogs” own film, researchers have proven the TVs and CRTs unloaded from import containers tend to be newer, working, and repairable. In fact, African importers claim the western goods fail less often than new product imported from China (perhaps because failed electrostatic discharge units are diverted from nations with warranty law enforcement). One allegedly sham NGO (non-government entity) uses a government-sounding-name which implies it’s actually part of the Basel Convention Secretariat, an international organization. The NGO regularly invokes the name of the Convention – but is actually criticizing activities (export for reuse, refurbishment, and repair) which are explicitly legal under the Basel Convention (Annex IX, B1110). Meanwhile, the non-profit actually lobbies to change or amend the Convention, and confuses environmentalists, retulators, and journalists into thinking the Convention has already been amended. The non-profit activists use the same kinds of photos as legitimate charities like Unicef, CARE, Oxfam, and Doctors Without Borders. But critics say the pictures are a fraud, and part of a cynical campaign netting donations for wealthy white people. Following the money. Not a dollar goes to the children whose photos are exploited. Whether or not those children benefit from denial of trade, the money itself goes to carpeted offices in Seattle, where people who never met the actual importers spend it on more advertising. Small businesses in Africa and Asia which cannot afford new computers say it is a vicious, cynical, and racial profiling hoax. Like any other dirty little secret or payola scam, they say the “non-profit” knows exactly what it’s doing. According to critics, here’s how the “ewaste” fraud works. Greenpeace and Basel Action Network travel to the very poorest places in the poor nations. They take pictures of children next to piles of “e-waste”. The photos are typically taken at landfills and dumps which get all the trash from the neighboring cities in China and Africa. The NGO doesn’t take pictures of mattresses, broken pails, discarded shoes, or other standard trash. They find a pile of 20 year old scrap computer monitors… being burned. The volumes photographed represent just a tiny sliver of the world trade, and may well have been used productively in Africa for years before being thrown away. But placed next to children, the photos make Americans feel guilty about throwing away their own computers. The used computers are miles away from the containers of gently used product imported and refurbished by “geeks of color”, the people who provide the only affordable internet for most of the world. Children are posed beside the broken electronics, sometimes with a close-up of the manufacturer logo on the device. Then, in describing 15,000 repair techs in Ghana, or warranty takeback factories in Indonesia, BAN states (in a recent press release) that resellers and refurbishers “often produce hazardous waste, which is responsible for inflicting tremendous harm on the citizens and environments in these nations.” There is no study to support this allegation of poisoned profits, no downstream pollution … and the photos of children have nothing to do with refurbishing plants. But after the plethora of photos of primitive recycling yards, Americans and Europeans are ready assume the worst about “those people”… all six billion of them. Not all Americans are strong in geography. Many Americans accept that “83%” of human beings in the world are all kind of brown, all kind of primitive, all kind of the same… people who carry things on their heads, like in Tin-Tin comics. The term “non-OECD” doesn’t bring to mind cities like Singapore, Taipei or Shanghai, which collective generate more e-waste on their own than their counterparts in Europe or the USA. The headlines in the USA don’t show manufacturer takeback factories… but they link those refurbishing factories to images of dirty dumping. “Recycling e-Waste in India”, “Refurbishing e-Waste in China”, Cairo, Dubai, Singapore, Brasilia, etc., all gets advertised as the same as the landfill in Ghana. Historically, import for refurbishing and upgrade has been one of the best economic contributors to developing markets, allowing nations like South Korea and Singapore to “leapfrog” many of the OECD nations themselves. That path, critics protest, is being cut off for African “geeks of color”. Photos of poor children beside burning electronics churn the hearts, but don’t show a significant volume of material at all… just a few dozen computers at the landfill in Ghana. Most of computers at the dump were imported into Ghana decades earlier, and used productively for years. But these photos are are mixed with photos of black people unloading sea containers. No one notices that the goods inside the containers appear to be nice, new, repairable, working electronics… but people notice that Africans carry them on the head, and no reporter questions the economics, interviews a technician, or notices the gap between the landfill and the sea container. It has become a lucrative business for non-profits and sellers of shredding machines. BAN sells the ‘rights’ to an “Ethical E-Steward” label to companies which pay BAN 1% of their income as “certified recyclers”. Even to see the “directions” to become an ethical steward costs thousands of dollars – the NGO does not publicize its standards or requirements. The vast majority of electronics handled by these “steward” companies is shredded, managed as “no intact unit”. And most of the scrap material pieces are still sold to China and India, the same as the working and intact used product! OEMs (Original Equipment Manufacturers) with “planned obsolescence” and “anti-gray-market” agendas may also be getting on board, and some promote the NGO handsomely. No technicians are interviewed. The photos of “primitives” become a poster child for 83.1% of the world’s population, for warranty repair shops and computer monitor manufacturing factories, and for emerging engineering markets like Singapore and Taipei, Jahor, Islamabad, Semarang, and Shanghai. NGO makes millions, hires more staff to fan the flames. Basel Convention allows trade of used and repair of electronics. There is no data saying that 80% of e-waste is processed in primitive conditions. The actual data shows that reuse and is 85% of the trade to Ghana, for example. The largest markets for used computers – contract manufacturing factories in Penang Malaysia, Singapore, and other “non-OECD” countries – have higher incomes and more engineers than the European Union. The campaign against trade, or anti-globalization, seems to be succeeding. Photos of the Ghana Agbogbloshie, for many, describe the trade between 16.9% of the world and the other 83.1% of the world. Mining for “three Ts” (tin, tantalum, and tungsten) for new electronics represent more pollution and toxics than the worst reuse. These mining activities offer a poor choice of employment for Africans, but the door to recycling is closed, while trade in conflict metals are flourishing. A group of USA Recyclers has formed to make the NGO’s policy against exports law in the USA, and is using lobby money and images of Africans at landfills to promote their agenda http://www.americanerecycling.org/home.html. Still, for some activists, “fair trade recycling” is a better answer than a “boycott of brown people” or “shredding repair jobs”. Repair and reuse of affordable computer monitors benefits represents a better opportunity out of poverty… exponentially better than mining the raw material to make brand new electronics. Meanwhile, 3 comprehensive studies have failed to corroborate the NGO’s claims that most used electronics exported to Africa are dumped rather than reused. GHANA E-Waste Country Assessment 2011 finds 85% reuse. Nigeria Assessment Study puts reuse and repair at 91%. Either figure is similar to, or better than, failure of brand new product returns. 2012 UNEP and Basel Secretariat studies find 85%-91% reuse. 2013 US International Trade Commission Report: More than 85% of used electronics generated in USA are recycled in USA, not exported. Discarders of electronic goods expect them to be recycled properly. But almost all such devices contain toxic chemicals which, even if they are recyclable, make it expensive to do so. As a result, illegal dumping has become a lucrative business.